The first Miyazaki film that I watched many years ago was Spirited Away (2001). It was a simple tale of a young girl who, on the way into a new neighbourhood, is accidentally trapped in the spirit world. The only way to exit that world is to cross a bridge by sunset. Unfortunately for the little girl, her parents, having partaken of a dish of pork at a restaurant, have been turned into pigs themselves. Now she has to find a way not only to turn her parents back into humans, but to also escape the spirit world before it's too late. It was a whimsical fable dealing with inter-generational conflict, Japanese culture and the effect of modernity upon it, through the eyes of a courageous little girl. It was a tale that touched your heart in inexplicable ways, and was not restricted to one generation. My older son, then a little boy, was as spellbound by the tale unfolding in front of him as we, his parents, were. In these intervening years, we have watched several other Miyazaki movies – Ponyo, The Wind Rises, From Up On Poppy Hill... suffice it to say, I've never yet watched a Miyazaki film that I haven't liked. So when my husband ordered Princess Mononoke (or Mononoke Hime, which is its Japanese name) from Netflix for our second son, I sat up to watch it as well. On the face of it, Princess Mononoke (I shall continue with the English name, since I'd watched the English version of this anime feature.) is another simple tale, like one of our folk tales. A courageous hero, a curse from an animal god, a journey across lands to seek redemption from the curse, a beautiful heroine, anthropomorphic animal characters, an internecine war, and so on. Underlying it, however, are very serious themes of man vs. nature. So, onward, my friends, to the tale of Ashitaka and San, Eboshi and Jiko-bō, Moro and Okkoto, and several others. 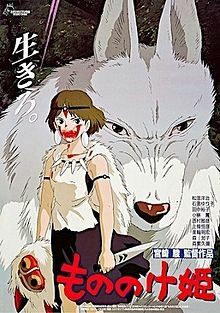 Princess Mononoke is set in (Miyazaki's version of) the Muromachi period in Japanese history. A time, legend says, when gods and demons roamed the earth. Like all good epics, the film begins with a foreshadowing. Deep in the forest, the Emishi villagers are uneasy. One of the watchmen atop a tower has spotted something disturbing in the forest. Some of the women returning from the forest have also sensed the presence of something untoward. Ashitaka (Yōji Matsuda/Billy Cruddup), the last young Prince, who is out on his loyal elk, Yakurru, advises them to enter the stockaded gates as quickly as they can. The village wise woman has called every villager to her hut. He climbs a lookout point to see if he can get a good view of the presence he has only so far sensed. When the monster (for monster it is, with its flesh made of writhing snakes) comes into view, who makes short work of anything in front of him. As the villagers watch horrified, Ashitaka is thrown off the lookout, and the boar itself is like no boar they'd ever seen before. After a fierce struggle, Ashitaka manages to kill the boar, though the animal leaves its imprint on the young prince. It is the wise woman who tells the prince what the stones foretell: he is cursed. The boar was once the Boar God, Nago, now turned into a demon, poisoned by an iron ball that had lodged inside him. His touch had cursed Ashitaka, and as the poison of hatred spreads, it will burn his flesh and bone, and soon, he will die. Ashitaka's only hope is to travel to the Western lands from whence the boar came. It is the only way to find a way to stop the curse from killing him. But from now on, she warns him, he is dead to his tribe. The villagers are aghast. The emperor had banished them to the outposts many centuries ago. He had killed any of their tribe who was found; now they are to lose their prince? Ashitaka does not complain. One stroke of his sword cuts off his coiled hair, and makes him as foreign to his people as any other man from outside his tribe. As he leaves, his affianced wife, Kaya, paying no heed to the village laws that forbade her from seeing him go, gives him a crystal for remembrance, and to keep him safe. Ashitaka and Yakurru make their way across the land. On the way, he's befriended by a wandering monk, Jiko-bō (Kaoro Kabayashi/Billy Bob Thornton), who tells him that the secret to his cure may be in the hands of the Spirit of the Forest, who is a Qilin by day, changing into a nightwalker at sunset. Ahead, a great lady, Lady Eboshi (Yūko Tanaka/Minnie Driver) is at the head of a train of men herding oxen across the hills to Iron Town, the township that she runs. The group is attacked by the wolves, headed by the Wolf Goddess, Mora (Akihiro Miwa/Gillian Anderson) and her foster daughter, a young girl San (Yuriko Ishida/Claire Danes). Lady Eboshi sends her men and the oxen ahead, and prepares to deal with the wolves. In the battle that follows, some of the herders and soldiers plunge to their deaths below the narrow mountain paths. Lady Eboshi takes aim at Moro and manages to shoot her; it takes more than one bullet, she tells her bodyguard, Gonza (Tsunehiko Kamijō/John DiMaggio), to kill a god. When he asks her about the men who have jumped, or been pushed, off the path, Lady Eboshi is matter of fact: they would have died; her duty is to the men who are alive. They need to get them to safety. However, two of the men are lucky; falling into the lake, they are rescued by Ashitaka, who decides to take them back to their township. However, the only way to get there is to go through the forest. One of the men, Kohroku (Masahiko Nishimura/John DeMilta), is aghast. The forest spirit will kill them! No one, no one can cross the forest alive. Allowing Kohroku to mount Yakul, Ashitaka carries the other man on his back as they wend their way through the forest, which is the shortest way back to the township. On the way, he runs into San and her wolf comrades, but she leaves the place without responding to him. The forest spirits, the Kodama, guide them through the forest. Soon, however, they pass through the lush green forest to where Ashitaka can see a fortified town across the lake. Kohroku tells him that ironsand is being mined to produce iron in the town. The tired men eventually reach Iron Town, where Ashitaka is greeted with disbelief. How could he have reached the township so fast? The workers, however, greet Kohroku with delight, and take their unconscious comrade to where he can be treated. While Gonza wants to imprison Ashitaka as a spy for the samurai who are battling them for possession of Iron Town, Lady Eboshi welcomes Ashitaka and allows him free run of the town. Ashitaka is intrigued by her ladyship – on the one hand, she's cleared vast tracts of land to mine the iron sand to produce iron, bringing her into conflict with the forest gods. On the other, she has rehabilitated several brothel workers and lepers, putting them to work at the bellows and at designing firearms. There is no doubt that she is dearly beloved of them. Lady Eboshi is also the person who shot Nago, turning him from God to demon, poisoning him with the lead bullet and hate towards all humankind. She explains to Ashitaka that San, whom she refers to as Princess Mononoke (Monster Princess) was raised by the wolves who regard her as one of their own. Like her foster mother, Moro, San hates humans, and helps the pack to fight back against Lady Eboshi and her men encroaching on their space. Lady Eboshi asks Ashitaka to remain there and help her kill the Spirit of the Forest. While they are talking, San and the wolves attack the township. San is trapped near the stockade, and is knocked unconscious. While the men rush to capture her, Ashitaka intervenes, but San surprises him. Soon, she's facing Lady Eboshi. Eventually however, Ashitaka stops the fight by the simple expedient of knocking both women out. Gonza is a mute witness to Ashitaka's superhuman strength. As Ashitaka leaves Lady Eboshi with the women, and walks out with the unconscious San, one of the women, whose husband was killed by the wolves, shoots him. Sustained by the power of the curse, Ashitaka opens the gate single-handedly, and manages to reach the forest before he collapses. San has regained consciousness, and wants to kill Ashitaka for saving Lady Eboshi. Something stops her. The Kodama keep watch as San guides Yakkuro, bearing an unconscious Ashitaka, into the the lake in the forest. She drags Ashitaka off the elk's back into the water near the shore of an island in the lake, and frees Yakkuro. As the sun rises, the Nightwalker turns into the Great Spirit. As the majestic being bends down to touch Ashitaka's wound, its magic touch heals Ashitaka. The curse is too powerful, however, and Ashitaka realises that the poison is beginning to spread. Faithful Yakkuro is still waiting beside his master and San realises that the Great Spirit wants Ashitaka to live. A fragile trust springs up between two unlikely allies. Meanwhile, Okkoto (Hisaya Morishige/Keith David), the blind Boar God, is on the move with his clan. They have travelled for months to get up here to the forest of the Great Spirit. They have come to destroy the humans and save the forests. Seeing San in the forest is bad enough; human though she is, she is Moro's daughter, and the Wolf Goddess can still bare her fangs. However, Ashitaka is fair game, and the boars are furious when they hear that the Great Spirit saved his life. Why couldn't the Forest Spirit have saved Nago? Moro warns the boars to pay heed to Nago's fate. She too is poisoned, but she has lived long and is now contemplating her death. While the news upsets San, the boars are in no mood to listen to Moro, or to Ashitaka, who tells them the truth about Nago's death. Luckily for them, Okkoto is willing to listen, though even he advises Ashitaka to leave the forest. Or the next time they meet, he will kill the prince. Okkoto is going to risk everything in one last battle. Moro tries to stop him, but the Boar God is determined. The boars will either fall in the attempt, or they will free the forests. Back in Iron Town, Lady Eboshi has other troubles. She is battling the samurai warriors of Lord Asano while she brings the ironsand back to the town. The rebel lord will declare true if she will give him half the town. Jiko-bō throws in his lot with her: if she helps him get the head of the Great Spirit in return for the Emperor's pardon, he will help her destroy Lord Asano. After all, she owes him. He'd provided the rifles and the men that had allowed her to build up Iron Town. Now, he wants payback. The head of the Great Spirit. The legends say that the head will confer immortality. Lady Eboshi is a woman of her word. She leaves Iron Town in the capable hands of the women and the lepers, and sets off with Jiko-bō and his men. The boars are on the move, and San decides to travel with the them so she can be Okkoto's eyes, while Moro, knowing that she will die soon, decides to throw in her lot with the Forest Spirit. Ashitaka wakes up to find them all gone. He too must leave the forest. So begins an epic battle between the gods of the forest and the animals on one side and the humans on the other. The boars fight bravely but they are no match for Lady Eboshi's guns. The townspeople have been decimated by being cleverly planted on the frontline by Jiko-bō so they would lure the boars in. Jiko-bō and his men disguise themselves in boar skin and trick Okkoto into leading them to the pool of the Great Spirit. Okkoto has been poisoned by a hail of bullets, and the lead (and hate) corrupt him just as it had Nago some seasons ago. San, riding his back, is also infected by the demonic curse. A weary Ashitaka and Moro, nearing the end of her life, manage to save San from Okkoto. The boar, poisoned by hatred, is now more demon than god. Not far away, Lady Eboshi and Jiko-bō are waiting for the Great Spirit to appear. When he does, Lady Eboshi shoots him, just as Ashitaka dives deep into the lake with San, in a last ditch effort to save her. As a god, it takes more than one shot to kill him, and he frees both Okkoto and Moro from the poison spreading in their veins. As the humans wait impatiently, twilight falls over the forest. It is time for the Forest Spirit to turn back into the Nightwalker. This is the moment that Jiko-bō and Lady Eboshi has been waiting for. Despite Ashitaka's desperate effort, Lady Eboshi succeeds. What will happen now? Will the Great Spirit die? What will happen to the Kodama when the forest dies? Moro has achieved her ambition; Lady Eboshi has lost her hand. Will she survive? Will Jiko-bō get away with his booty? What will happen to Ashitaka and San? Where Miyazaki diverged from the usual tales was in giving a chance for two disparate worlds to tell their own stories. This is not a black and white retelling of an ancient debate about nature vs. industrialisation. Lady Eboshi is ambitious, yes, but she is seeking to survive in a world where wealth is power. While she has no use for the gods, she is compassionate towards the men and women who work in her town. She rescues women from brothels and provides them with respectable work in her foundry. She treats them with respect and trains them to defend themselves. She is equally compassionate towards the lepers, who would otherwise be social outcasts, giving them both sanctuary and their self-respect. There are no outright villains or saintly heroes in this tale. The humans are both good in some ways and evil in others; the animals are both gods who create life, and filled with hatred towards what humans are doing that that they too turn demonic. Ashitaka and San finally become the bridge between the two worlds. It is they who learn that man and nature need each other; they must co-exist. Beautifully animated, mostly using traditional, hand-drawn methods of animation, Princess Mononoke uses very little computer animation and digital painting. The visuals are breathtaking. The forest of the Great Spirit was inspired from the ancient forests of Yakushima; the animals are not Disney-cute (even though Disney distributed the English version). They look what they are – cruel predators who will kill when necessary. It's in their blood. Moro cannot even see that San is human; San is neither wolf nor human, she tells an anguished Ashitaka; San is of the wolf tribe; when the forest dies, so must she. Deeply moving, Princess Mononoke explores the way Nature and humans have always been in conflict, giving each a valid voice and refraining from taking one side over the other. This sort of balance is very difficult to achieve, and it is to Miyazaki's credit that he manages to achieve the seemingly impossible. Even at the end, where San and Ashitaka, who have fallen in love with each other, realise they cannot live together – their ways lie apart. When is the last time you watched a hero and heroine, loving each other, go their own ways, ways that may perhaps bring them in conflict again?